Why dip your toes in the water when you can take a running start and cannonball right into the world of homebrewing? With the Premium Homebrew and Kegging Starter Kit you can skip the bottling-induced headaches and go straight to kegging your first batch. Get everything included in two of our most popular kits at an even better value! 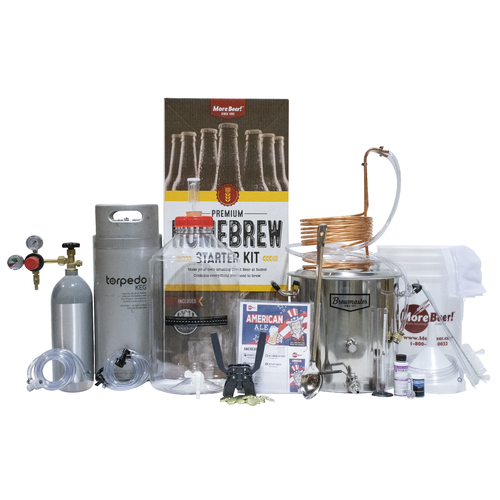 Starting with the brewing equipment, you'll receive everything that comes with our top-shelf Premium Homebrew Starter kit (BRKIT300). This includes a massive 8.5 gallon stainless steel brewing kettle, 7 gallon Fermonster fermenter, copper wort chiller, American Pale Ale ingredient kit, and all the time tested brewing equipment you need to make beer at home. The large volume kettle allows for Full-Boil brews, which can have lighter color and better hop flavors. No need to fuss with a funnel or siphon thanks to the included kettle spigot, which can be used to safely and easily transfer liquid from your kettle to your Fermonster fermenter. The Fermonster is the perfect vessel for your first batch, and the 7 gallon capacity means you won't have to upgrade down the road when you want to brew beer styles that foam a lot during fermentation. Several of the most popular upgrades for new homebrewers include a larger kettle, a larger fermenter, and a wort chiller. With this kit you can check off those boxes on Day 1! Brewing is a labor of love. But few love the labor of bottling their finished brew. Luckily for you, everything from the 5 gallon Torpedo Homebrew Kegging kit (KEG410) is also included. When your brew buddies swap bottling horror stories, just listen and nod your head politely. We won't tell anyone that you skipped the bottling stage entirely! This system is comprised of absolutely everything you need to dispense your homebrew on draft. The dual gauge regulator will tell you the pressure in the keg, as well as how much CO2 is left in the tank. Comes with an aluminum CO2 tank that will never rust. 5 feet of 3/16" ID beer line, ideal for draft systems, so your beer drops to the correct pressure and does not excessively foam in the glass. 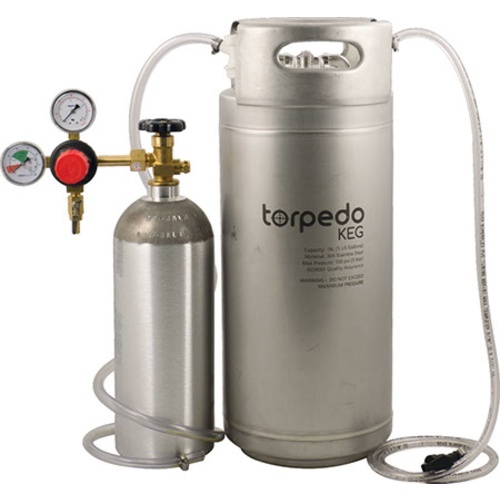 Last but not least, this system features the 5 gallon Torpedo Keg, an all stainless ball lock keg with a commercial style. These kegs are stackable and feature rolled handles that make transport a breeze. The CO2 tank is shipped empty. You can have it filled at a welding supply shop or see your Yellow Pages under Gas- Industrial, Medical. Looks like the perfect set up for a beginning homebrewer. This is a very extensive kit that was highly rated. Love the kegging system. This will save me so much time not having to bottle everything! Living in Alaska there are not stores that carry this sort of things. Online is the best way to go. 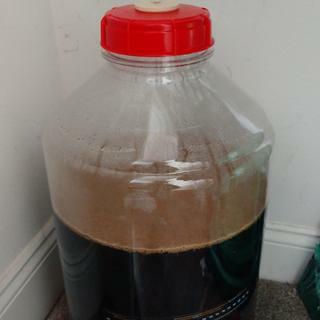 Giving home brewing another try after 20 years. Always liked the idea of kegging instead of bottling. Looking to get started and this sounds like this system has everything we need. This is a great kit for homebrewing. My only gripe, per se, is the hydrometer package was damaged which caused the hydrometer to shatter. I reached out last night to support and they are shipping a new one already. They are quick and efficient and I am going to be using MoreBeer for future homebrew purchases. Love my premium Homebrew kit. The starter beer ingredient kit was great, and having the keg and CO2 was the cherry on top. I would highly recommend this kit this is my first time brewing but not the first time with a keg so it was perfect for me. Was missing a funnel not included in kit so transferring was a little difficult but other than that it was great. Easy to use and very complete. First batch of beer is still fermenting so I can't tell you that I make great beer . . . yet; but I am really having fun with this and I expect that it will only get more rewarding! Excellent kit. Has everything needed to start brewing and kegging. Already brewed and patiently waiting to try! Everything needed to brew and keg your first batch of home brewed beer. Came with everything I need, and tomorrow my first brew will be done with secondary fermentation and will be ready to be kegged. I’m very excited! I really like this kit. It made it easy to buy everything I needed without worrying about missing out on important equipment if I pieced together my own kit. The price wasn’t even too bad considering what I got with it. Best Bang for you a buck! Love the kit, I have me the fundamentals to start brewing on my own really easily. The pale ale kit it came with came out great and tastes awesome. I’m starting to do all grain brewing, and I have pretty much most of what I need from the starter kit. I would highly recommend this kit for anyone looking get serious about brewing at home. Perfect to get started (again after 20 years). Already kidded the beer kit included and enjoying at a family beach vacation. Would recommend.